When we were driving through France our favorite summer lunch wherever we stopped was Salade Niçoise. Composed and artfully arranged a little differently in each restaurant, the salad’s snappy flavors and bright colors always hit a high note on those warm, traveling days. Julia Child called this her favorite main course salad. It’s mine too and like she did, I enjoy it all year round. But it’s especially delicious in summer when vegetables are at their freshest and hot weather calls for a light refreshing meal. 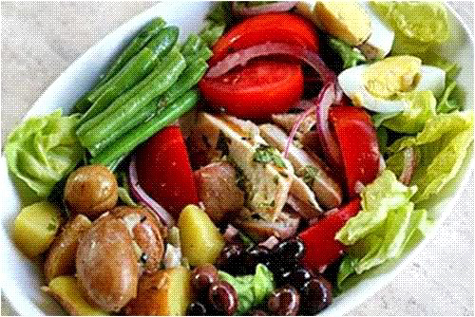 The main ingredients are tomatoes, tuna, string beans, potatoes, olives, capers, anchovies, hard-boiled eggs, lettuce and tangy vinaigrette. Serving six people, here’s Julia’s classic Salade Niçoise recipe from “Julia’s Kitchen Wisdom” by Julia Child. This next recipe from Epicurious.com is a combination of a classic Salade Niçoise and a variation from the creative Alice Waters, owner of Chez Panisse, who visits France every summer to enjoy, among other things, the delicately flavored, fine green beans of the season. Instead of canned fish, the recipe calls for fresh tuna barbecued with rosemary and olive oil. The vinaigrette is spiced with fresh tarragon and chervil leaves. Perfect for a large summer gathering, the recipe serves eight to ten. Mediterrasian.com’s recipe extols this Provençal salad’s overflowing, valuable nutrients, including proteins, vitamins, antioxidants, potassium, fiber, Omega-3 oils, and energy driving carbohydrates. For a more festive variation, they suggest poaching fresh salmon or tuna filets and cutting them into chunks in place of the canned tuna. After a long steamy summer day I sometimes make a streamlined, double quick version of Salade Niçoise for dinner, eliminating the anchovies and, to cut down on stove heat in the kitchen, eggs and string beans. Before boiling the potatoes, I cut them into bite size pieces, so they cook in the brief time it takes to prep the lettuce and tomatoes and whatever other salad veggies I’m in the mood for. Then in goes the canned tuna (or salmon), capers and whatever olives I have on hand. I pop all the ingredients in a large bowl, pour in some vinaigrette and — though purists might weep — toss the whole tasty shebang together. Along with its health, economic and ease of preparation benefits, Salade Niçoise is super versatile and can be personalized to suit anyone’s culinary tastes. I love Salade Niçoise! It’s not vegan though, so I’d have to find alternatives for the eggs and tuna. Over the weekend we prepared a luncheon of butternut squash soup followed by a platter of avocado stuffed with shrimp salad, Green’s restaurant wild rice salad and a green salad with Green’s vinaigrette. I had some of the shrimp salad but the wild rice salad was hearty enough I didn’t need to — Martin didn’t eat the shrimp salad and wasn’t hungry. It’s hard figuring out how to entertain for mixed diets! But maybe I could figure out a way to serve Salade Niçoise that works for vegans and non-vegans. That avocado with shrimp salad sounds delish. Summer heat has now reached a point where I need a VERY GOOD reason to turn on my stove. And I haven’t found one lately. Maybe you could try hummus in place of the tuna and eggs. Am now a huge fan of hummus. For variety think I’ll try pink or black beans instead of chick peas. Seem to remember a recipe for that in my hummus post. Yes, hummus works, but also that wild rice salad. Hummus is easier though. We were so pooped it’s taken two days to recover! I FINALLY got around to posting on Diana Vreeland. A fascinating character. I love her, but I wouldn’t want to have to be her. The thing is, I thought I wanted to be her at first, but as I learned more, I didn’t.